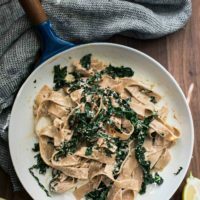 Kale Pasta with Sunflower Cream Sauce | Naturally.Kale Pasta with Sunflower Cream Sauce | Naturally. A delicious, vegan pasta that uses garlicky kale and tossed with an easy sunflower cream sauce. Cook pasta according to direction, drain, reserving the liquid, and set aside. Heat a large pan over medium-low heat. Add the garlic and cook for a minute, just until fragrant. Add the kale to the pan and continue to cook for for a minute or two, just to start the kale wilting. Once the kale has wilted slighting, remove from the heat and add the pasta. Combine the soaked sunflower seeds with the water, lemon juice, lemon zest, smoked paprika, and salt in a high-speed blender. Puree until smooth. Add to the pan and toss. Add a splash or two of reserved pasta water as needed to thin and coat the noodles. Serve with a sprinkle of chili flakes as needed. Tips + Tricks: I typically soak the sunflower seeds for two hours before making. Make the sunflower cream ahead of time for a quick dinner.